We’ve created an interactive splits tool that allows you to create your own custom reports by combining splits of various metrics. All the splits that FanGraphs hosts are featured here, along with some new ones — including times through the order, outs and day/night. The controls have three different sections: stats, splits and group by. The “Stats” bar allows you to toggle between the three different groups of stats we currently host on a player’s split page. This isn’t too different from the standard, advanced and batted-ball tabs we feature elsewhere on the site. The “Splits” bar is the most important control within the splits tool; this is where you can select which splits are applied. When no splits are applied, you’ll get the full season stats. When a split is applied like “vs. LHP,” you’ll get only the plate appearances against a left-handed pitcher. If you add another split like “Groundballs,” you’ll get all ground balls against left-handed pitchers. 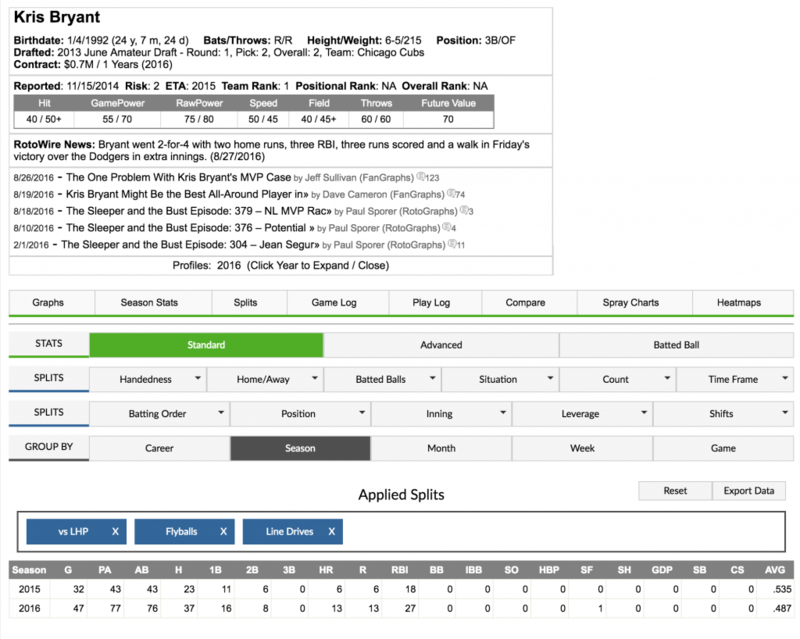 As you add splits from different categories, you’ll narrow the number of plate appearances. The splits which are applied appear as blue blocks above the table. If you wish to remove a split, either click the “X” on the split or unselect it within its menu. Mutually exclusive splits will be additive. Instead of narrowing the number of plate appearances, you will widen it. For example, selecting the splits “Line Drives” and “Flyballs” produces splits which include either a fly ball or line drive. If should also be noted that if you select every option within a mutually exclusive group (ie. “No Outs,” “1 Out” and “2 Outs”), you effectively haven’t applied any split, since all the plate appearances will be included. There is no limit to how many splits you can apply, but you might not have a meaningful result getting either a small sample or full-season stats. The “Group By” bar allows you to select how the stats are organized. You can see the career totals, or have them broken out by season, month, weeks, or even games. If you are familiar with SQL, this controls the GROUP BY statement. As always, if you have any comments or problems please let me know. The splits tool is built upon play-by-play data going back to 2002. This means this tool will only provide splits on the play-level and not the pitch level. Creating specific splits can lead to small sample sizes, which can cause problems for stats that were created with full season, neutral context in mind. Some stats will behave oddly when splitting or creating a small sample. Fielding independent pitching (FIP) is a well-known of example of this. FIP is an ERA estimator based solely on innings pitched (IP), strikeouts (K), home runs (HR), hit by pitches (HBP) and walks (BB), if you create a split (say through an 0-2 count) where the Ks significantly outweigh HR, HBP, and BB, the FIP will be negative, which is not a valid value for ERA. We include the first nine charged plate appearances. We encountered a few unique situations, where a player would not complete a plate appearance because of an out of the base paths. The first partial plate appearance does not count, but the second full plate appearance will. You are able to specify “as SP” or “as RP” through the “Position” split. It’s possible to get no data for splits if there are no applicable plate appearances. There might be slight discrepancies in FIP, xFIP, wOBA and wRC+ between the splits tool and the legacy splits page, we used different methods to determine constants and adjustments to allow for flexibility. “As LHH” or “As RHH” will return only plate appearances. Stats from the base paths will be ignored. “First Half” and “Second Half” are determined by All-Star Games. The batting average stat for the split “Balls in Play” is NOT BABIP since it includes home runs. BABIP removes home runs. The “Count” splits represent when a plate appearance had that count at one point, not the count on which the plate appearance ended. The “Export Data” function will provide numbers as decimal and not percentages. It also won’t round to familiar formats. This provides more compatibility with Excel and other data-analysis software. Weeks begin on Monday and end on Sunday. Months are used in two areas: the “Time Frame” split menu and the “Group By” button bar. 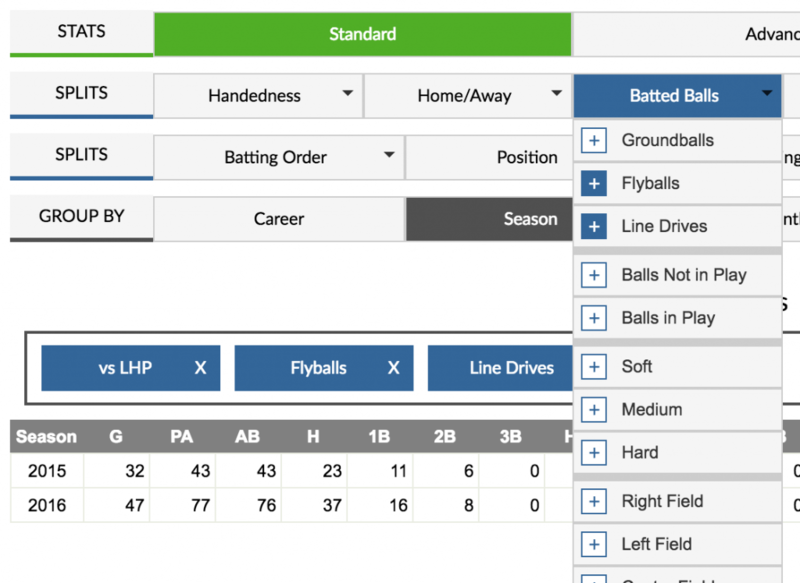 The split menu will filter plate appearances, while the “Group By” bar will determine if the stats should be combined together or delineated by month. For example, you could see how a player performed in March, April and May. By grouping by season, you will see one stat line for each season; if you grouped by month, it would show you one stat line for Apr/Mar and another for May. This has been tested on current versions of Chrome, Firefox and Safari. It may not be supported or fully supported on older browsers including Internet Explorer. We hoped you liked reading New Interactive Splits Tool! by Sean Dolinar!